Hi there! Visit us often to see our process and the new pieces we've been working on. Until we post more updates, please check out our online store at CHAIRISH. Spring is here!!! Get a free set of our Orchid Print paper coasters with ANY purchase on our CHAIRISH shop! We are testing some Quebracho bark tea and an iron-vinegar solution to ebonize some oak stool frames. Its a bit time consuming but we love the results! Visit our Chairish online shop and take a look at the vintage items we have been collecting and adding our own Parrothorse touch. Please follow us to keep up to date with the latest pieces available for purchase. Very easy process, just make an offer and choose the best shipping option that applies. PLUS every customer receives a set of paper coasters with their purchase! While supplies last. 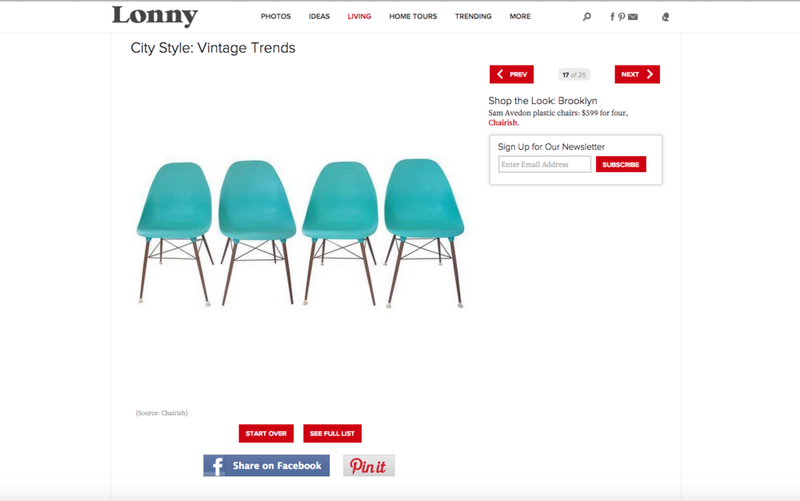 Chairish vintage online retail stoe co-founder Anna Brockway, curated a collection of City Style: Vintage Trends for Lonny Magazine, and we are so excited that she included our Sam Avedon chairs for the Brooklyn look. 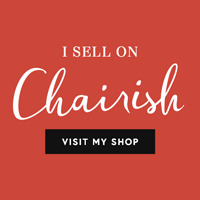 Thanks Chairish for including our chairs in the article! We chose a Louisville local company to build the sapele structure and they did an amazing job. We found the perfect color for the top with the help of our customers and a local vendor: Shiitake by Caesartone.